The more I see of The Solus Project, the more I regret dismissing it as a bog-standard, endless survival game soon to be mired in perpetual development, and not just because that chap's voice acting is convincing in a forceful and slightly sinister way. I'm prepared to give it the benefit of the doubt when it arrives in Early Access on February 18. The Solus Project has all the hackneyed survival elements—temperature, environmental hazards, hunger, thirst—but tied into a narrative structure that promises to marry free-form open world survival to more directed, significant landmarks that conceal mysteries relating to the planet itself. In other words, there is a point to surviving, which is my hang-up with most Early Access survival sims. It's why I prefer Skyrim's Frostfall mod to, for example, DayZ. The latter augments the experience of playing, in the former, survival is the experience. It also addresses a common failing of so-called exploration games: there is stuff to find. The Solus Project's climate system looks to be quite the achievement—even cloud cover will affect your chances on Gliese-6143-C. Encountering the tornado at 1:11 would have me in the foetal position. Better still, though crafting is very much a staple, the devs hope to avoid rote gathering and production-line output of basic tools. 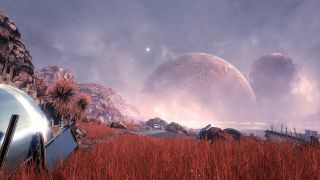 I have the usual misgivings about Early Access as a concept, but The Solus Project looks like one of the more accomplished projects to run the gauntlet. It puts me in mind of a more open, less mentally punishing Myst.